Espresso machines come in all shapes and sizes. Their prices range from $50 to $5,000. Some are semi-automatic; others are super-automatic. Depending on their exact capabilities, they can create lattes, cappuccinos, macchiatos, ristrettos and espresso con pannas. It's a lot to take in, right? Before you start making yourself dizzy with all of the different products and possibilities, let us narrow down some of your options. Here are 10 of the best home espresso machines for 2019 on the market. If you're in a hurry, you can jump straight into our top picks (these are the machines that most people buy). 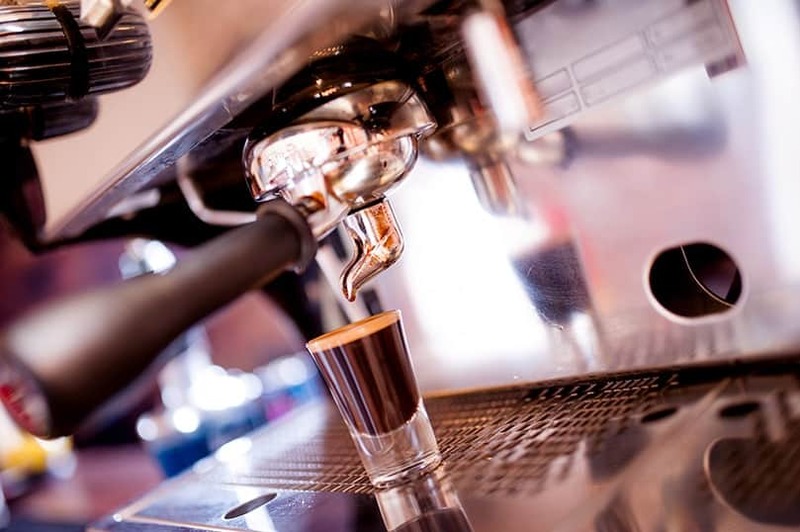 Check out our top 10 list of the best rated espresso and cappucino makers. Let's delve into the 2019's espresso machine reviews one by one. Offering equal amounts of power and precision, the Breville Barista Express will deliver beautiful espressos for a fraction of the cost of other brands. You control your morning cup of joe with the Breville Barista Express. Utilizing everything from an integrated burr grinder to a thermocoil heating system, this machine will take the guesswork out of mixing espressos. The biggest selling point of the Breville Barista Express is its mechanics. A high-quality beverage is made with high-quality parts, and thanks to dual wall filters, stainless steel burrs and 360° steam wands, the Breville Barista Express comes with all of the equipment that you'll need to brew something delicious. You'll also find that the Breville Barista Express is a convenient kitchen tool. Adjustable settings will allow you to experiment with temperatures and grind sizes, and removable tampers and filters will offer further customization options as you work. Hidden storage compartments will keep your coffee bar both clean and organized. The very best thing about the Breville Barista Express, however, is that it won't break the bank. You can enjoy amazing coffee drinks every single morning without watching your dollars drip out like your espresso shots. Now that's value! If you only buy one espresso machine, make it the Breville Barista Express. It provides the best value for the money by combining speed, power and functionality in a single convenient package. Perfect for both amateur baristas and experienced coffee gourmets, the Mr. Coffee Cafe Barista will suit a wide variety of needs, settings and lifestyles. One of the top sellers in super-automatic espresso machines (under $200), the Mr. Coffee Cafe Barista is easy to use and even easier to clean. It's the kind of product that will simplify a chaotic kitchen or busy break room. First up is its built-in milk frother. Not every espresso machine has an automatic milk frother that will deliver smooth, creamy drinks like a high-end coffeehouse, but the Mr. Coffee Cafe Barista does. It also comes with single- and double-shot options for cappuccinos and lattes of all sizes. Next is the one-touch control panel. There's no use having customization options on your espresso machine if you can't understand its settings without a technical manual, but the Mr. Coffee Cafe Barista makes it simple. The buttons even come with pictures so that there's no confusion over what you're doing! If that isn't enough convenience for you, you'll also receive a tamper, measuring scoop and single- and double-shot filters with your order. The company will even throw in free coffee recipes at no extra charge. With the Mr. Coffee Cafe Barista, everything that you need to get started will be right there in the box. 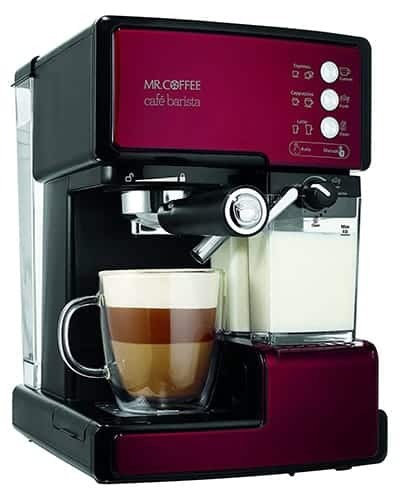 Suitable for coffee junkies of all types and tastes, the Mr. Coffee Cafe Barista will make an excellent addition to a wide variety of kitchens. If you love specialty drinks but lack the time or energy to play barista every morning, let the Saeco Exprelia EVO make life easier for you. 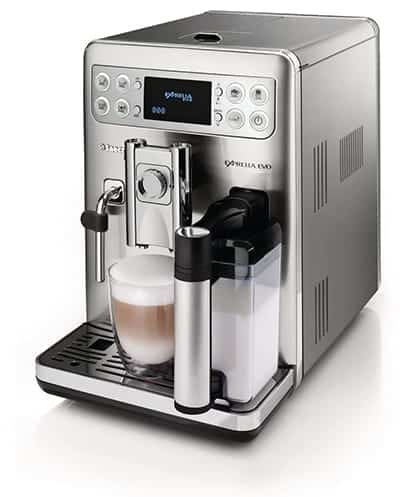 From creamy cappuccinos to milky macchiatos, the Saeco Exprelia EVO was designed with frothy beverages in mind. It's a super-automatic machine, so you won't have to spend hours in front of your espresso maker figuring out buttons and controls, but it also comes equipped with the kind of specialized technology that's necessary for bubbly, foamy coffees. You can thank the H2 Technology Milk Carafe for most of its capabilities. It will steam, boil and aerate your milk products so that you'll get super-fine bubbles every time. It also boasts a dual chamber functionality that will ensure optimal crema and body boost. A cutting-edge frother rounds out the trio for a fantastically frothy finish. In terms of ownership, the Saeco Exprelia EVO is also one of the most convenient products on the market. It will save your preferred grind settings, descale itself at your command and even steam its chambers upon power-up with an auto-clean function. It doesn't get much simpler than a machine that takes care of itself. If you have a busy life that doesn't leave you with a lot of time for fancy, high-tech espresso makers, consider the Saeco Exprelia EVO. According to our experience, it will work and maintain itself with minimal effort on your part. If you like your coffee "just so," the De'Longhi Magnifica ESAM3300 can be easily adjusted and customized to suit everyone in the family. There's a lot to love about the De'Longhi Magnifica ESAM3300, especially if you and your spouse are the type to bicker about beans, grinds, temperatures, flavors and caffeine levels. This machine will bring peace to your mornings by allowing everyone to get the cup of coffee that they desire. Choose between regular, specialty and decaf. Grind fresh beans or load pre-ground coffee into a second chamber. Change roast settings and cup sizes with a push-button control panel and detailed menu options. The De'Longhi Magnifica ESAM3300 was built to be accommodating, so you'll have plenty of choices when you step in front of the unit. It's a powerful espresso maker, too. It utilizes everything from an automatic frother to an integrated burr grinder to ensure that every cup is just the way you want it. It will even self-adjust for your espresso shots depending on your programmed settings. Last but certainly not least, the De'Longhi Magnifica ESAM3300 is a compact machine. Despite its extensive performance capabilities, it will fit on most countertops without crowding or cramming. It's hard to ask for more from a personal espresso maker. 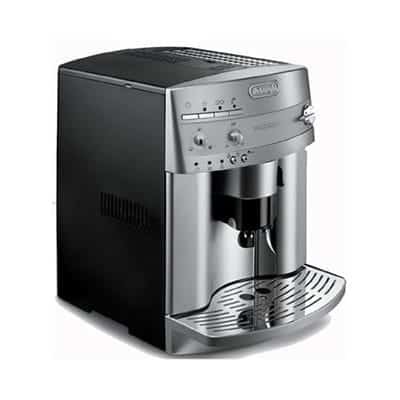 Suitable for homes and small offices, the De'Longhi Magnifica ESAM3300 will keep everyone happy despite their different coffee preferences. Strong and steady, the Rancilio Silvia Espresso Machine will deliver results in a variety of residential and commercial environments. The most notable feature of the Rancilio Silvia is its volume capacity. Holding 12oz in its boiler and 62oz in its water reservoir, it's one of the largest espresso machines in its price range, and it can produce cup after cup without slowing down or straining its resources. It's well-suited for both personal and professional settings where you need more than one mug in the morning. The Rancilio Silvia is also popular for its steaming capabilities. A steaming knob helps you adjust the pressure in incremental degrees, and an articulating steam wand gives you a full range of motion. You'll get the froth exactly right when you have these kinds of tools at your disposal. You might also be attracted to the Rancilio Silvia for its size and strength. With iron frames, stainless steel side panels and a chrome-plated boiler, this espresso maker could survive the apocalypse. It won't break down like some of the flimsier models on the market. It's a steady, durable machine that will last as long as you take care of it. Speaking of care, the Rancilio Silvia requires a relatively low level of maintenance. You'll need to clean it, but that's a simple process that won't require any special tools or techniques. Rancilio will even throw in a coffee scoop and a couple of filter baskets to add to the convenience of your espresso maker ownership. 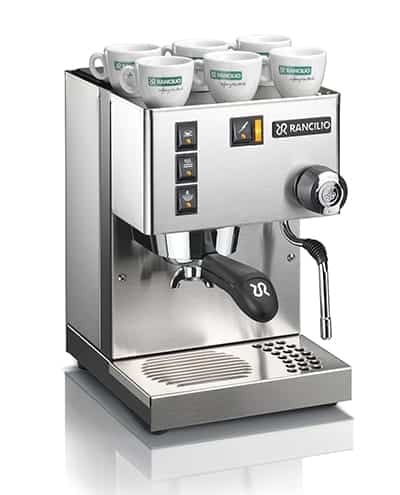 Whether you're an office manager looking to treat your employees or an individual coffee addict with high volume requirements of your espresso maker, the Rancilio Silvia will get the job done. If you have simple espresso needs, look for a simple espresso maker like the Keurig Rivo System. Let's say that you aren't interested in imported coffee beans and fancy drip trays. Maybe you just want a basic espresso maker that will allow you to push a button and receive a latte. This is where the Keurig Rivo System excels. With three frothing modes and 15 bars of pressure, the Keurig Rivo System is more than capable of brewing quick and easy drinks. It doesn't matter if you're looking for a cold froth glace or a large, special-flavored vienna; this machine has the power to get it done. 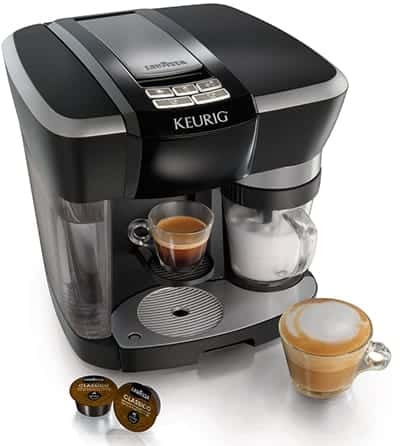 Where the Keurig Rivo System stands out from the crowd is its ease of use. It doesn't try to impress you with complicated bells and whistles; it provides a very simple, straightforward set-up where every cup and capsule has its place. There's a separate area for brewing and milk frothing, and an automatic on/off setting will ensure that you never burn down the house. You won't even need the instruction manual to get your brew going: All of the buttons come with pictures. If you're tired of looking at espresso makers like a caveman trying to understand hieroglyphics, let the Keurig Rivo System provide an easier path. "Rivo" is Italian for "revolutionary," and in the modern world of espresso makers, simplicity is quite revolutionary indeed. If you're looking for a no-fuss, no-stress espresso maker, the Keurig Rivo﻿﻿ System will deliver a great cup of joe without any of the technobabble. Save yourself from the long lines and inflated prices of your local cafe by spending your money on the Nespresso Inissia instead. The first thing that you'll notice about the Nespresso Inissia is its price. Though it's a fully-functional espresso machine, it's also very friendly to household budgets. It will provide the same kind of lattes as big-ticket espresso machines but for a fraction of the cost. The second thing that you'll notice about this product is its size. As a capsule machine, the Nespresso Inissia is small and lightweight. It won't take up a lot of room on your countertop, and it'll fit into dorms, kitchenettes and coffee bars with ease. You can even travel with it. On top of everything else, the Nespresso Inissia provides long-term value with the convenience of its capsule system. Though Nespresso will get you started with a 16-set "welcome" pack, you can buy your own capsules for years to come, experimenting with different tastes and aromas as your palette grows and your coffee preferences change over time. Say goodbye to that expensive coffee joint down the block. It's time to make your own caffeinated beverages with the Nespresso Inissia. With replaceable coffee capsules and an easy-to-use brewing system, the Nespresso Inissia is an investment that will pay you back time and time again. As a bonus, it won't cost that much as an investment in the first place! Despite its small size, the KRUPS XP1000 will deliver a mighty cup of coffee to wake you up in the mornings. 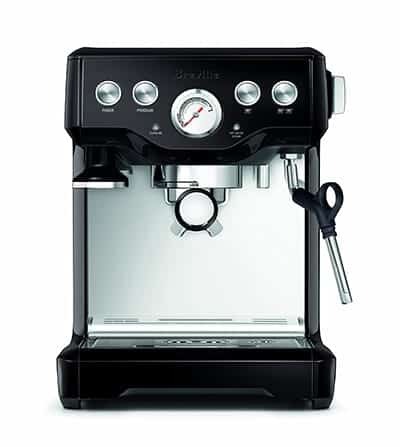 The KRUPS XP1000 is perfect for small spaces where a traditional espresso machine would crowd or make messes. It's only 12 x 9.8 x 14.1 inches and 4.4 pounds, so it can fit right between your blender and toaster without any kind of difficulty. But what about its power? you might be wondering. 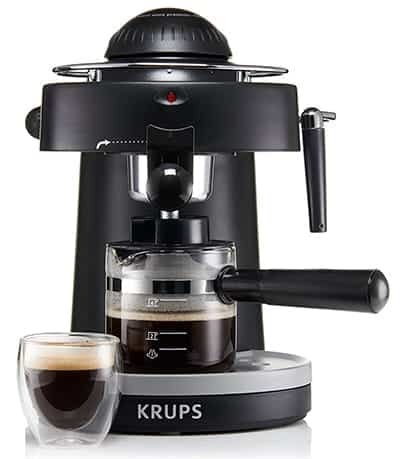 Have no fear: The KRUPS XP1000 can make all kinds of espresso drinks. 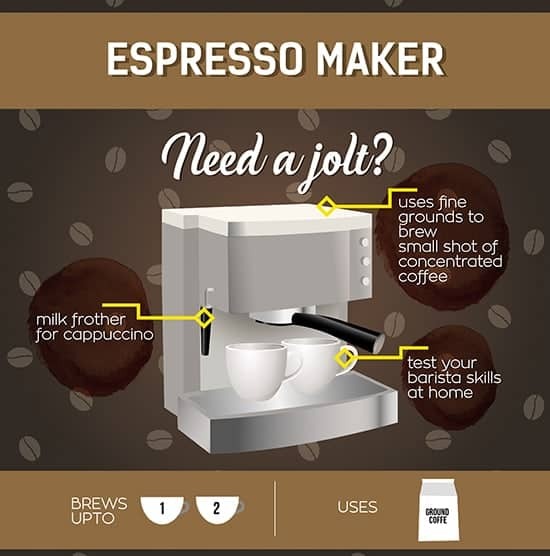 All you have to do is load the appropriate compartments with water, milk and coffee grounds to create a steaming espresso within minutes. As a bonus, the holding capacity of the unit is four cups, so you won't have to fumble with replacement filters during cold or drowsy mornings until you've already ingested several ounces of caffeine. Another great thing about the KRUPS XP1000 is its customization options. Though it doesn't have lights or programmable menus, it comes with an adjustable knob and steam nozzle to ensure that you get the right blend of flavor and froth. It might be a simple machine, but it can still be personalized. Speaking of simplicity, you'll love how easy it is to rinse and clean the KRUPS XP1000. The drip tray grid comes right off so that you can wash it as necessary. Some customers have even reported sticking it in the dishwasher with no ill effects! It may be tiny, but this espresso machine will get the job done. Check out the KRUPS XP1000 on Amazo﻿n to see for yourself why you shouldn't judge a book by its cover. When precision technology meets simple functionality, the result is the Breville Infuser. If you're new to the world of espresso machines, you might be intimidated by all of the functions and features advertised by manufacturers. How do you know what's necessary and what's not? What kind of controls should you be looking for with grinders, heaters and infusers? While these questions are important to consider when you're dropping thousands of dollars on a fancy espresso maker, they can be pushed aside for something like the Breville Infuser. It does provide advanced technology in the form of state-of-the-art grinding and extracting systems, and it is impressive when you judge its thermocoils against the heaters of other brands, but none of that actually matters if you're a confused newbie. You see, the Breville Infuser may offer a menu of settings and controls, but you don't have to use them. It comes with fully automated controls that can do all of the work for you. From a temperature-regulating heater to an automatic purge function, this is a unit that can be turned on and forgotten about while you continue your morning routine. It will deliver a perfect cup of espresso whether you're paying attention or not. This is why the Breville Infuser is such a good product for beginners: It straddles the line between automated and customized. When you're still new, you can rely on its internal mechanics to do all of the work. 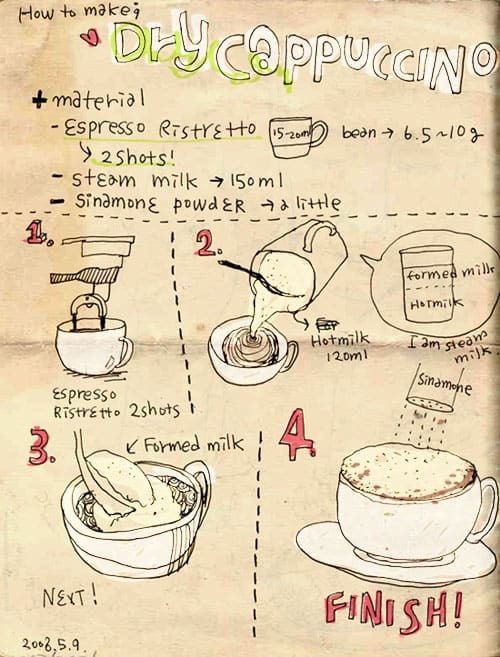 When you're more comfortable mixing your own espresso drinks, you can take the reins and start experimenting on your own. You can't find another espresso maker that can offer that level of flexibility. The Breville Infuser is an espresso maker that will grow with you. If you don't believe us, check﻿ ou﻿t some of the glowing customer testimonials on Amazon. The De'Longhi EC155 is an all-in-one product that will meet diverse espresso needs in a simple and affordable package (under $100). Maybe you like chocolate mint mochas. Maybe you prefer white raspberry lattes with as much foam as the cup can handle. When you purchase the De'Longhi EC155, you can make them all. For starters, the 15-bar brewing capabilities will ensure that you always have enough power and volume to make your favorite coffee beverages. The manual frother will allow you to hand-blend the perfect amount of milk and steam. The three-in-one filter holder will contain single shots, double shots and espresso pods to suit all of your coffee needs throughout the day, so you'll always have options. Another great thing about the De'Longhi EC155 is its 35oz water tank. Not only is it nice and large, but it's also removable for easy cleaning and refilling. Stop staining your countertops as you experiment with personal coffee creations! If you're looking for a good all-in-one-product, it doesn't get much better than the De'Longhi EC155. It might not be the biggest or "smartest" item on the market, but it provides options, and that's what an espresso lover like yourself needs most of all. 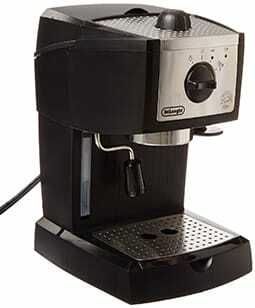 The De'Longhi EC155 is a great all-around product that's sure to satisfy even the most discerning of espresso lovers. These are just a few of the best espresso machines that money can buy. Whether you're looking for a simple brewing system or an advanced piece of coffee technology, let these products serve as a jumping-off point for further research. With so many products on the market, it can be difficult to determine which is the right espresso maker for you. Here are just a few tips for narrowing down your options and finding the machine that will wake you up the right way on cold mornings! Manual units come with a lever that you'll need to physically operate to create your espressos; all of the automatic units use electric pumps and varying amounts of motorized features to do the grinding, frothing and pouring for you. Some units have more boilers than others. Some come with advanced steaming or grinding technology for extremely precise espresso shots. Some can make four cups at a time; others can make a dozen. There's no right or wrong answer when it comes to what you're looking for in an espresso maker; just make sure that you consider all possibilities before pulling out your checkbook. Most espresso makers come with the ability to make simple drinks like lattes and cappuccinos. If your favorites are more complicated, however, you might want to look for a specialty machine. For example, if you're addicted to ultra-rich chocolate mochas teeming with milky foam, you should look for espresso makers with advanced milk frothers. 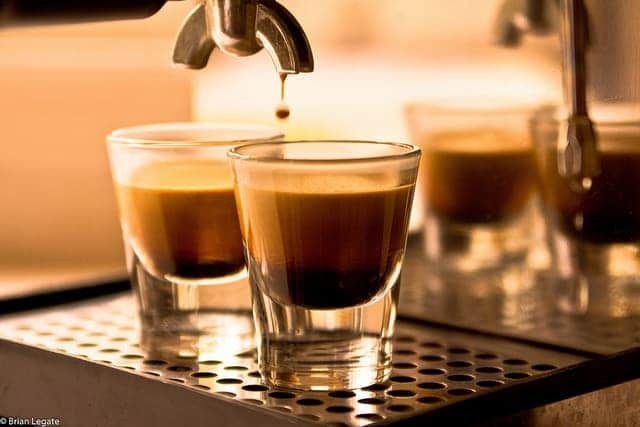 Espresso makers can range from "dirt cheap" to "crazy expensive" depending on their size, brand, wattage, volume capacity and level of technology. You'll need to decide for yourself how much you're willing to spend for the perfect cup of joe. Just keep in mind that some products will require special cleaning tools or replenishment supplies like flavor capsules! These are just a few things to ponder as you search for the perfect espresso maker. Buying an espresso coffee machine can give you headaches. You may find a lot of brands that offer a variety of tasks. It is wise to do some serious research before buying a coffee machine that you will use it daily. We’ve put together some questions and answers to make your job easier. Expensive espresso coffee machines out there are made out of quality materials and can make the whole process smooth. You won't see a difference in quality if you spend a couple of hundred more; it all depends on you and how you like to drink your coffee. When it comes to taste, it’s less about the machine and more about the q﻿﻿uality of the coffee and the brewing process. You can find a lot of research put into this subject on forums or videos all over the Internet. If you are not making any money from brewing coffee, then the affordable alternative is a good choice. This is where you need to pay attention. Otherwise, your coffee’s quality will suffer. Check if the device can control the temperature of the water. The finer the control, the better your espresso coffee will be. Also, a thermostat is a must. 2. 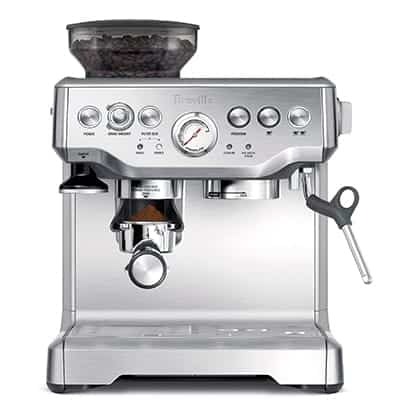 ​What should I be looking for when purchasing an espresso coffee machine? You should take into account the maximum pump pressure and see if it’s self-priming or not. Also, look at the type of boiler the device comes with. Is the machine easy to clean? How smooth does it work from start to finish? These factors can also affect the process of coffee making. ​3. Is this machine enough for me to enjoy a fresh cup of black magic every morning? Not quite. A quality bean grinder is needed. Unless your espresso machine doesn’t come equipped with one, you will have to buy it. You will do the grinding yourself and then pour the contents into your device. Remember, the finer the grind, the better the coffee, no matter what type of coffee you choose. ​4. Can I learn to brew coffee like a pro with such a device? You can check out our in-depth brewing guides about it. There is a lot of material covering all sorts of coffee brewing methods. Are you ready to buy your first espresso coffee machine? How much money would you spend on such a device? What other things you should look out for before purchasing a device like this? Let us know in the comment section! P.S. All images are courtesy of the respective manufacturer's and other free image services (Pixabay, Pexels etc). I have a delonghi ECAM 45 but cannot get the temperature to the equivalent of a push percolator. Have it on the maximum but it is still not hot enough for my taste. Are there machines that do this better?